The Jeep Grand Cherokee is a premium SUV that's virtually unbeatable in off-road handling in its class. This reliable family vehicle surely deserves the acclaimed Trail Rated badge. Capable of achieving a 44:1 crawl ratio, the Grand Cherokee gets superb traction on rough surfaces that are inclined. When it runs into a creek or river, the vehicle continues to move forward without any mechanical issues. In fact, this model has a water-fording design of 20 inches. Additionally, the 394 Ramp Travel Index indicates excellent articulation on hills and slopes. You'll also be amazed by the Grand Cherokee's ground clearance parameters, including an approach angle that exceeds 36 degrees. 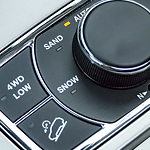 Available at B & B Chrysler Dodge Jeep Ram, this Jeep SUV could be equipped with the trademark Quadra-Drive II 4x4 system, which has been thoroughly tested in extreme conditions. If necessary, the drivetrain could divert all available torque to one wheel that might be stuck in mud or dirt.